More than 100 of our region’s top HR practitioners packed the ballroom of the Renaissance Airport Hotel for the Annual Dinner Meeting of the Society of Human Resource Management of Greater St. Louis. One of the largest and most active chapters in the country, SHRM invited SDI to be the featured presenter at this, their largest meeting of the year. 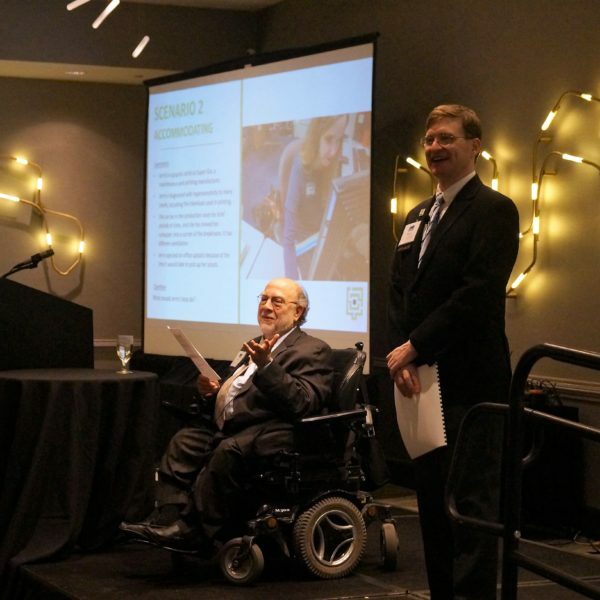 SDI presented “Up Your Disability IQ in 2019.” Our Lead Consultant David Newburger, and Adult Career Services Coordinator Jason Hartfield, presented 4 real-world scenarios in each phase of employment that would spur rigorous discussion and test the bounds of knowledge. Each table of professionals discussed a scenario for recruiting and hiring, accommodating, disciplining and terminating. Robust discussion ensued after each scenario was presented. Audience members were then encouraged to share conclusions drawn at their tables. Newburger and Hartsfield asked additional probing questions, and lent expert advice in each scenario.